Kim, Yongtae, and Meir Statman. “Do Corporations Invest Enough in Environmental Responsibility?” Journal of Business Ethics, June 2011. Authors' abstract: "Proponents of corporate environmental responsibility argue that corporations shortchange shareholders by investing too little in environmental responsibility. They claim that corporations can improve their financial performance by increasing their investment in environmental responsibility. Opponents of corporate social responsibility argue that corporations shortchange shareholders by investing too much in environmental responsibility. They claim that corporations can improve their financial performance by reducing their investment in environmental responsibility. Yet, others claim that corporations serve their shareholders well by investing just enough in social responsibility, not too little and not too much. If so, corporations increase their investment in environmental responsibility when an increase improves financial performance and reduce their investment in environmental responsibility when a decrease improves financial performance. Our evidence is consistent with this last claim. We find that the behavior of corporations is consistent with the claim that they act in the interest of shareholders, increasing or decreasing their investment in environmental responsibility as necessary to improve their financial performance." LK comment: Strong paper. Moskowitz Prize Honorable Mention in 2011. 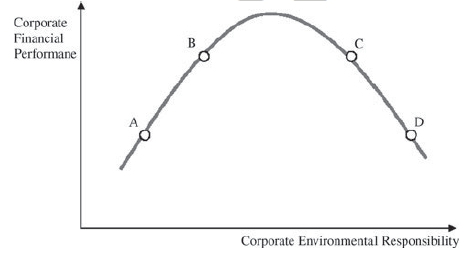 Hypothetical relationship between corporate environmental performance and corporate financial performance. This illustrates why it’s so difficult to make comprehensive statements about whether investments by firms in corporate social responsibility pay off or not. From a financial perspective, there is some optimal level of investment - however difficult to estimate ex ante - in these types of initiatives. Some believe companies systematically underinvest, and advocate higher levels of spending. Some believe companies are over-investing, and should curtail spending and return the capital to shareholders (or invest in other, higher ROI opportunities). I think Kim and Statman are framing the question in exactly the right way here, not just for environmental investments but for all ESG-related ones. For managers of a firm, the key question should be, “where are we on the Kim/Statman curve?” We can’t know exactly, of course, but we can make estimates. And firms that think about it this way should get better financial results than firms that set their investments according to some ideological view (either pro or con) about corporate social responsibility.